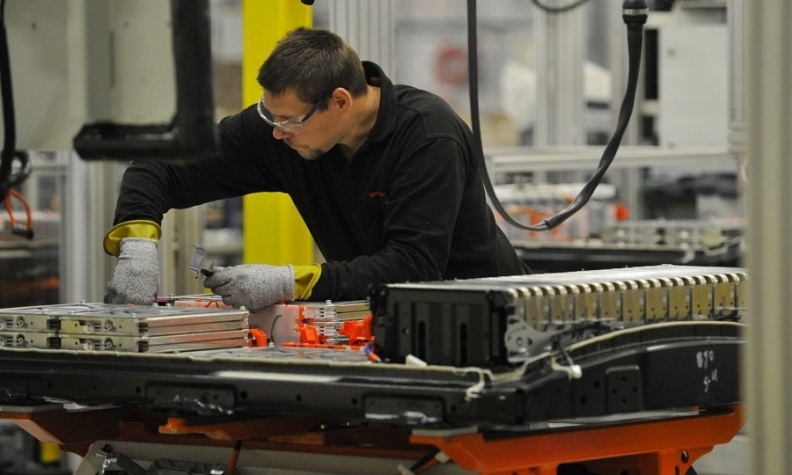 Production at Nissan's UK battery plant, which produces battery modules for the Leaf and the e-NV200 van. TOKYO --Nissan has agreed to sell its electric car battery unit to Chinese renewable energy firm Envision Group for an undisclosed sum. The announcement comes after Nissan cancelled a potential $1 billion sale of the unit to GSR Capital last month, saying the Chinese investment firm lacked the funds to make the purchase. Under the agreement, Nissan will retain a 25 percent share or equity interest in the entity newly formed by Envision. The deal, which covers battery plants in Smyrna, Tennessee in the U.S. and in Sunderland, England, is expected to close in March next year. The workforce at all facilities covered by the deal will continue to be employed, Nissan said in a statement on Friday. "The transaction will enable Nissan to concentrate on developing and producing market-leading electric vehicles – in line with the goals set in our midterm plan," Nissan’s Chief Competitive Officer Yasuhiro Yamauchi said. Lei Zhang, founder and CEO of Envision, said in the statement the partnership will help create innovative solutions for the "IoT value chain". The Japanese automaker has been wanting to sell the unit, Automotive Energy Supply Corp (AESC), as it looks beyond its unit to procure low-cost, high performing lithium batteries. Its automaking partner Renault sources EV batteries from South Korea's LG Chem. In August last year, Nissan had announced its plan to sell AESC to GSR for an undisclosed sum. A source told Reuters at the time that the Chinese firm had agreed to pay Nissan a total of $1 billion for the deal. But the deal faced a series of delays, including prolonged talks between GSR Capital and NEC Corp, which holds a 42 percent stake in the company, over the acquisition of its subsidiary NEC Energy Devices, which holds a 7 percent stake.